No Windows 8 Desktop Gadgets? Try these two tools to get them back! One of the features missing in Microsoft's latest operating system Windows 8 is desktop gadget support. Gadgets are programs that make their functionality directly available on the desktop. 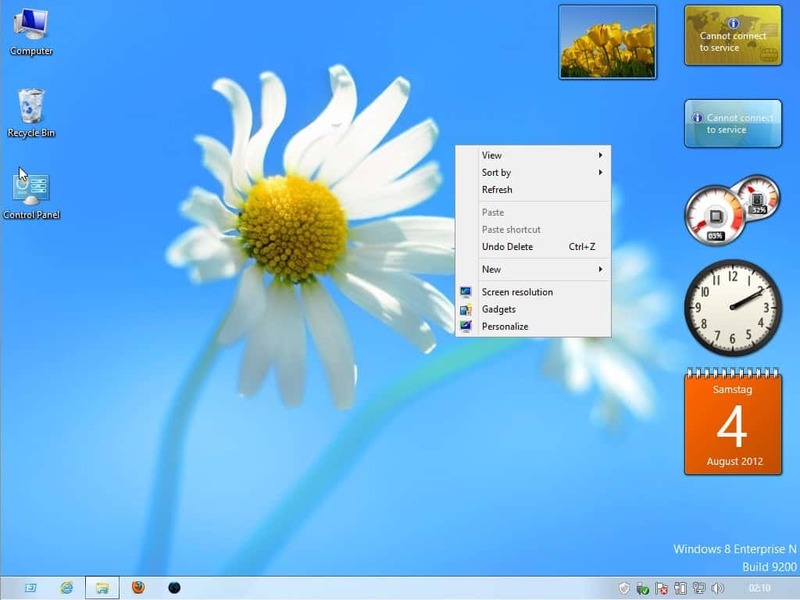 They were first introduced in Windows Vista limited to a sidebar area on the desktop, and then improved under Windows 7 where they can be placed anywhere on the screen. Microsoft recently released a security advisory that suggested to disable Windows Sidebar and Gadgets to protect the operating system against security vulnerabilities that exploit the feature. Microsoft in addition has retired the official gadget directory on the Microsoft website, and removed options to install gadgets on its newest operating system Windows 8. While there is no official option to add desktop gadget support back to the operating system, there are two unofficial ways to do so. Before you start to install one of the alternatives, I'd like to point out that you should scan the solutions with up to date antivirus software and create a backup of your system before you do so to avoid any issues. At least one solution adds the Windows 8 Release Preview gadgets system to the final version of Windows 8. The first solution was posted on the My Digital Life forum a few weeks ago. This uses the gadget files from the Windows 8 Release Preview to make the Windows Sidebar feature available under the final version of Windows 8. Just download the 32-bit or 64-bit version of the pack to your computer, extract them all to the Windows\system32\ folder and run the install.cmd file afterwards to install the desktop gadget support on the system again. This one is brand new, has been released a few days ago. It ships with an installer that is compatible with 32-bit and 64-bit versions of Windows 8 as long as the interface language is Chinese, English, French, German or Japanese. The installer will re-add the original Microsoft gadget files and settings that have been part of the beta of Windows 8. In addition, it ships with about 20 different popular gadgets that you can install right away on the system without having to go gadget hunting on the web first. You can alternatively install a desktop customization tool like Rainmeter which ships with a set of gadgets by default. While that won't give you support for native Windows desktop gadgets, it is something that may replace the gadgets that you ran under previous versions of Windows and want to have available at your disposal under Windows 8 as well. Microsoft retired gadgets in Windows 8, but there are ways to restore the gadget functionality. Wasnt there a recent security issue with desktop gadgets and Microsoft pulled them because of that ? No, actually it isn’t right. The gadget system itself has no security issues. The “problem” is that by installing a gadget you give it full access to your computer — just like any programs you download. That’s all there was to it. BobbyPheonix has it right. Gadgets were dropped from Windows and the gadget gallery discontinued for only ONE reason: to force people towards Metro. That’s it. @Scott The real reason MS removed them was because they want everyone to use “Not Metro” tiles. Those who use gadgets will miss them, and MS thinks the tiles will make users want to use the “Not Metro” interface since they can’t use the gadgets anymore. MS is doing everything against what the consumer wants with this experiment they call Windows 8. Please MS just give us the options to boot to desktop. Use gadgets. Use a start button. Use Aero Glass. And most of all just let us be. If it’s not broke don’t fix it. Don’t change things just to change them. Windows 7 is perfect. Excuse me, but nobody is forcing you to use Windows 8. Carry on. Most computer manufacturers are forcing you to use Windows 8. By the way old grandmas area also adverse to change. Absolutely being forced into 8 by Microsoft. Just bought a new computer today, and am NOT liking the transition. Yes. It is mentioned in the last sentence of the first paragraph. as was for Windows 8 RP (Windows8-ReleasePreview-UpgradeAssistant.exe) ? I was not able to locate one yet, but would love to get my hands on a standalone. Great I hope it works! It’s unfortunate that we see more good things taken away from the Microsoft Operating System. It would have been nice that if instead of getting rid of gadgets they improved their security standards so that all gadgets complied with operating system security principles. Oh well…I love Windows 7 and will keep it. Great app. Use it myself. The best way to get the start button back in win 8 is to install classic shell. It’s free and puts a customizable start button that’s better than all previous microsoft start buttons. avast is reporting that the installer includes malware and wouldn’t install it.